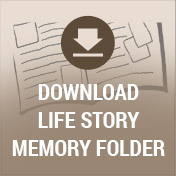 A reception with food and beverage will immediately follow the service in the Life Story Center. When reflecting on the life of Shirley Ray, it is easy to see that there was never a dull moment when she was around. Shirley was vibrant, fun and compassionate, and she had a zest for life that was contagious to all those around her. She was relentless in her pursuit to make sure that no stone was left unturned when it came to travel and the lifelong quest for knowledge. 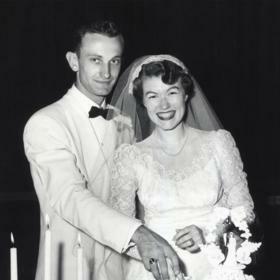 Together with the love of her life, Harold (Hal) Ray, she experienced many of the best things life has to offer. With a tender and compassionate heart, she lived to love and serve others in ways both great and small. Life will never be the same without her here, but she leaves behind a timeless legacy that is deeply rooted in love, graciousness and selfless generosity that will be carried on by all who were blessed to know her. Shirley was born on August 7, 1926 in Washington, D.C. to Charles and Anna (Smith) Walcott. She was later joined by a younger sister, Arlene, whom Shirley affectionately called Midge. Their father was a mail carrier, but after Multiple Sclerosis rendered him unable to work, Anna went to work at the Pentagon in the Department of the Air Force.  Growing up in Washington, D.C. made for an exciting life for Shirley. She was always on the go, being active in church and part of a choir that performed in the National Episcopal Cathedral. Shirley was also on the Arthur Godfrey radio show, on which she sang and danced. She attended public schools and while in high school, she was the only girl who took a small engine repair class. Shirley received the highest grade on the final exam in this class, which meant that she was able to attend ground school. Shirley ended up helping with the Civil Air Patrol during World War II and eventually took flying lessons. She was able to fly solo for 10 minutes, which meant that, in reality, she learned to fly before she learned to drive. After graduating from high school, Shirley attended Wilson Teacher's College and worked in the Library of Congress. 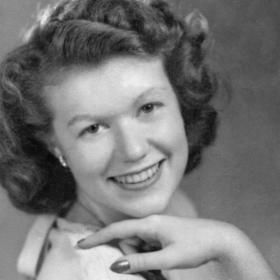 She then moved on to Syracuse University and earned her Master's Degree in Student Personnel in 1952. The best part of attending Syracuse was that she met the man of her dreams, Hal. Hal has always said that she was the best thing that ever happened to him, and the feeling was mutual. They were married on June 9, 1952 at St. Mark's Episcopal Church in Washington, D.C. After Hal graduated from Syracuse, he joined the Air Force and they moved to Ithaca New York. Their next adventure, after Hal's four years of service, they moved to Mentor, Ohio, where Shirley taught junior high English. 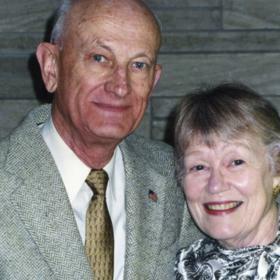 After two years of teaching, they moved to Ohio State University, where Hal earned his Doctorate and Shirley was the Dean of Women. In February of 1959, they welcomed their first son, Andrew (Andy). In 1960 the couple welcomed their second son Christopher and also in that same year they moved to Kalamazoo, where they both worked at WMU. Shirley had several jobs at Western over the years, including working at the bookstore, working with International students, counseling, and working for handicapped student services. In 1970, Hal took a sabbatical from his teaching and the family embarked on a six month long camping trip through Europe. They traveled through Europe in a VW vanagon and camped almost the entire time, with Shirley teaching the boys and educating them in history by visiting many museums all over Europe. This was among the most treasured times of their lives and their children’s. Hal took another sabbatical to Spain and Portugal in 1981. When their boys were grown, Shirley and Hal did not slow down any. They traveled all over the United States and Canada by participating in Elderhostels - week long classes for seniors in many locations, covering a multitude of different topics. In all, they completed 102 Elderhostels! They volunteered for many years in Florida at Give Kids the World, a village that is part of Disney, where seriously ill children can come to stay and participate in many fun activities. Shirley enjoyed operating the carousel, and Hal operated the train. Theater was a passion for Shirley, and she and Hal saw many, many shows at local venues and abroad. They attended the Stratford, Ontario, Shakespeare festival for 15 consecutive years. Giving back to the community and furthering the education of women was very important to Shirley. Shirley was a proud member of PEO, a women's philanthropic educational organization that gives scholarships to women worldwide who are in need of financial aid to continue their education. Shirley was also active in the Sigma Kappa Sorority at WMU, another organization that gives out scholarships. These organizations were very important to Shirley as she firmly believed in giving everyone the opportunity to further their education and increase their chances for success in life. 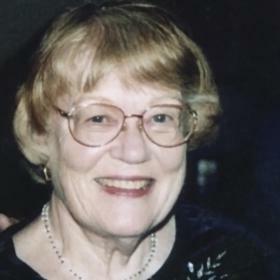 Shirley was a long time member and one time president of the University Dames at WMU. She also spent 20 years hosting professionals from around the world for the Council of International Persons. In her spare time, Shirley enjoyed needlepoint, knitting and sewing. That is, until she was diagnosed with Parkinson's Disease in 2010, which forced her to slow down a bit. Eventually they left their home in Portage and received more hands on care with the help of WMU's Aging Services. The rest of the time, she was lovingly cared for by her devoted, loving, amazing husband. Shirley was a fun-loving person who loved to entertain and host wonderful parties. All were welcome in her house. Shirley exemplified what it means to truly love and serve others, and her life was an inspiration to all who knew her. 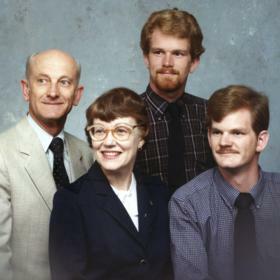 The true joys of Shirley's life were her sons, Andy (Alison) of Orlando, FL and Chris (Kristin) Ray of Galesburg, MI, along with four grandchildren - Alex, Miranda, Tony and Jeremy. She loved them more than life and made sure that she exposed all of them to the theater and fine arts. Shirley will be deeply missed by her family for many reasons, including her sense of adventure, her smile and her quick wit. They were by her side until the end of her life, and she wouldn't have it any other way.